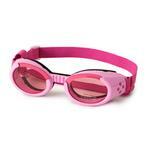 Doggles - ILS2 Pink Frame with Pink Lens Customer Photos - Send us your photo! 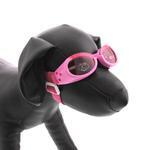 Alice Ali-gator (aka Ali or Gator) is sporting her new style Pink Doggles. Don't worry about the stickers on the lenses. They're not blocking her vision; Alice doesn't have any eyes. She does have lots of cool Doggles (they prevent people from bumming her out with 'poor baby' vibes), a large wardrobe she loves to dress up in (on/off/on/off is her favorite game), her own FB page (of course... lol), and a very important job as my medical alert dog. Wookiee is 3 1/2yrs old. She was born in WA state. Piper is a sweet pup that loves car rides. She wants the windows down so she can feel the wind in her hair. She has the doggles to protect her peepers. They also make her look pretty cool! I was really impressed with the prices and quality of the products.I would easily recommend this site to others and feel very confident I will be purchasing again from them in the future.